Summon: If you have more health than your opponent, draw two cards. 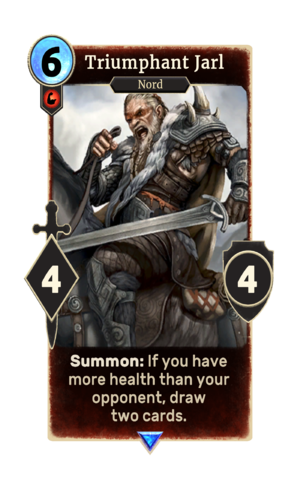 Triumphant Jarl is a rare Strength creature card. It is part of the Core Set. In addition to the card's availability in the Core Set, two copies are included in the Aela's Companions theme deck, two copies in the Redoran Onslaught theme deck, one copy in the Band of Survivors deck, and one copy in the Warriors of Hammerfell deck. "They run like cowardly skeevers!" "Chase them all the way to Sovngarde!" This page was last modified on 15 February 2019, at 00:40.